The Wavewalk® 700 Rigid Inflatable Boat (RIB) is multipurpose portable boat that offers high performance in harsh environments ranging from whitewater to blue water. The 700 RIB can carry a payload of up to 580 lbs, including passengers, gear, and motor. The 700 RIB’s watertight Saddle offers 180 lbs of positive buoyancy, and each of its XL 27.5 gallon inflatable flotation tubes offers 200 lbs of positive buoyancy – a total of 580 lbs of positive buoyancy. 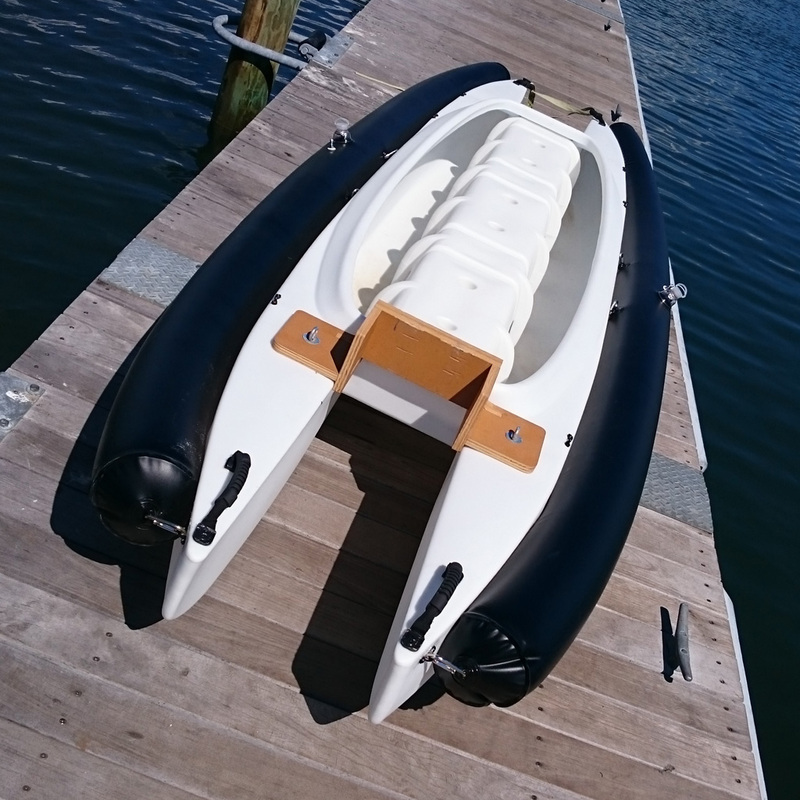 The 700 RIB features a W700 Heavy Duty motor mount, a Spray Shield, a Joystick Steering System, and a pair of XL 12 ft long and 7.25″ diameter inflatable flotation tubes. All these components can be attached and detached within seconds, and without using tools. Tender and lifeboat for big boats and yachts. Transporting the full-length inflatable tubes is very easy – When partially deflated, they fit perfectly in the hulls of the W700. Each inflatable tube is attached to the boat by 4 carabiners: One at each end, and two in the middle. Inflating is easy through the wide-diameter mouth valve. No need to use a pump, and it takes just a couple of minutes. That’s definitely looking more like a motorboat than a yak, Yoav. I think I’ll forego putting those overgrown looking sausages on my 500 – I’d probably put a hook through one of them and deflate it. I still don’t see a hat on you out there on the water?? The 700 RIB is a boat designed for diving, offshore work, rescue, and to serve as a tender boat. Having said that, it can be used for net casting, crabbing, etc., and spear fishermen can benefit from it as well. 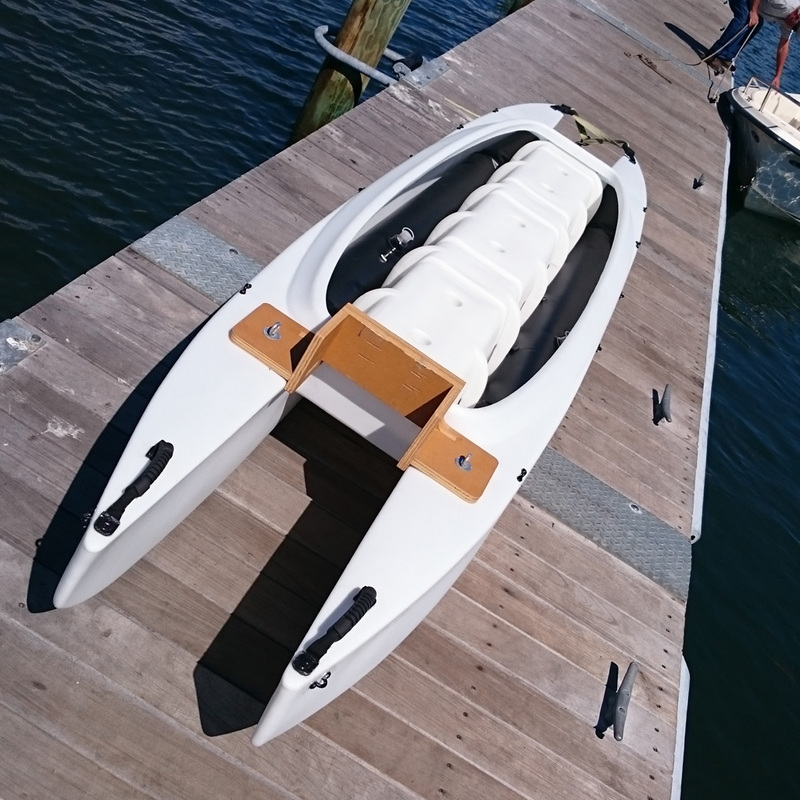 Adding a simple platform from lightweight 3/8″ plywood in the front of the boat would turn it into a full fledged bass boat, or skiff. Such platform can be made to cover the inflatable tubes, so the hooks won’t damage them. Reverting to a ‘kayak’ or ‘microskiff’ mode (namely sans inflatable tubes) would take just a few minutes. Add, lifeboat, to the list of uses for the W700 RIB. Strapped upside down atop a strong re-enforced T-top frame, the W700 can serve double duty as both shade and a standby lifeboat, in addition to all the other uses. The three Wavewalks on the overhead of my boat really do protect from rain and sun. But, if the unthinkable happens with a sinking scenario, we will be paddling to shore, somewhere. After his first fishing trip following heart surgery and catching most of the fish that day, my buddy, Skip looked up at the Wavewalks overhead that kept the sun from frying his recuperating carcass. “Those kayaks really are lifesavers.” he commented on the ride home. Thank Goodness, we did not have to really test his observation. I didn’t measure speed this time, but last time I did with a similar setup was a few months ago, on lake Massapoag, when I measured 11 mph at 1/3 to 1/2 throttle. I used a smartphone GPS based speedometer app named DigiHUD. A couple of years ago, Kenny “One-Shot” Tracy measured 13 mph at 1/3 throttle with the same outboard model mounted on a Wavewalk 500, and he did it in Chesapeake Bay, so I doubt the water he was driving in was mirror-flat. This time I opened the throttle up to 2/3, and I went faster than I had done earlier on lake Massapoag. I guess I was going at more than 13 mph. It didn’t come to my mind to check speed because the water was so choppy, with waves, strong tidal currents, and too many boats and boat wakes around. This location is not very good for speed tests. PS – According to Tohatsu’s user manual for this 6 hp motor, it can propel boats up the 3,000 lbs.